When you walk into the Home Start offices, you are greeted by a true Home Start Hero, someone who really cares about strengthening families and protecting children. 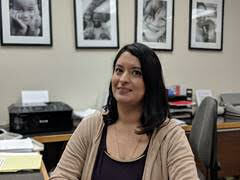 Meet Maria, our new Administrative Coordinator, which means she does A LOT to keep things running smoothly, including welcoming guests in person and over the phone. Before she joined our staff, Maria was a volunteer with our Communities In Action program, helping to facilitate the transition to our new location at Jacobs Center. She had a first-hand look at the positive effects our programs have. The variety of programs is also why she is so integral to her new position in the Home Start offices. She is a central link between all departments, making sure processes run smoothly. “I like being dynamic and not always sitting down at the desk looking at emails… I’m always running here and there,” she says. Home Start recognized her talents quickly, and Maria recognized that this was the kind of organization she wanted to work with full-time. After she graduated from San Diego State, Maria knew she wanted more. One experience that determined Maria’s commitment to Home Start was through her work with Communities In Action’s tax preparation assistance program. So far, Maria is finding gratification in her new role as well and is beginning to recognize what it is that makes this workplace so special. We don’t think Maria is just a good person, we think she is an amazing coworker and we thank her for sharing her Home Start story with us. If you want to be a Home Start Hero, check out our volunteer opportunities here.